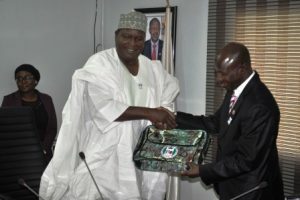 L-R: OTUNBA OLUSEGUN RUNSEWE, DG NCAC PRESENTING A LOCALLY MADE LAPTOP BAG TO MR. IBRAHIM MAGU, ACTING CHAIRMAN EFCC DURING A COURTESY CALL TO THE ANTI-CORRUPTION HEADQUATERS, RECENTLY. The Director-General, National Council for Arts and Culture, Otunba Olusegun Runsewe and the acting chairman of the Economic and Financial Crimes Commission (EFCC), Mr. Ibrahim Magu have agreed on a holistic approach of cultural reorientation among Nigerians as a permanent solution to stemming the menace of corruption in the country. This position was adopted and agreed upon when Otunba Runsewe alongside members of his management staff visited the headquarters of the EFCC in Abuja, Tuesday. As part of the itinerary for the visit, the NCAC DG took the campaign of cultural promotion to the headquarters of Anti-corruption agency in Nigeria suggesting that for corruption to be nipped in the bud, Nigeria needs to re-evaluate her value system which at the moment glamorizes people with questionable sources of income at the expense of hard work. “It will also interest you Mr. Chairman to note that if every criminal that has committed crimes outside the shores of this country is sent to EFCC after being deported, crime will be reduced to the barest minimum by now especially with effective biometric system for crime detection,” He added. On his part, the EFCC chairman thanked the doyen of culture for his kind words promising to fight on irrespective of how corruption is fighting back. He implored all Nigerians to champion the fight against corruption as its remains the only monster against all of us as a nation. Otunba Runsewe used the opportunity to decorate the EFCC boss with the iconic pin crest of NCAC and gave him a well crafted, locally made laptop bag thereby confirming his host as a cultural ambassador of Nigeria.